Turkey week saw shareholders of Hormel Foods, Becton Dickinson, and York Water get an additional helping of cash from their companies. Thanksgiving week wasn't only about turkey hangovers, football games, and Black Friday. Several noted companies on the stock market elected to raise their dividends around the holiday, providing a little extra dessert for their investors. Three of these notable raisers were Dividend Aristocrats Hormel Foods (NYSE:HRL) and Becton Dickinson (NYSE:BDX). Joining them was veteran utility York Water (NASDAQ:YORW). Let's take a glance at these three. Comestibles producer Hormel Foods last week upped its dividend for the 52nd year in a row. The company's quarterly payout will increase by 10% to just under $0.19 per share. That declaration came just before Hormel's Q4 and fiscal 2017 results announcement. For both the year and the quarter, total sales dropped -- in Q4, the year-over-year decline was 5%, to just under $2.5 billion, largely on a slump in the core refrigerated-foods segment. Net income fell more sharply, by 11% to $218 million. The two line items broadly met analyst expectations. Hormel's results took a hit from various factors, including a portfolio divestiture and price volatility in certain commodities. Nevertheless, the company is forecasting top-line growth of 3% to 7% on the top line for fiscal 2018, and a net income increase of 2% to 8%. Hormel's recent headline fundamentals might have declined, but in terms of cash flow, the company is swimming along. Operating and free cash flow have both seen an uptick lately, with annual free cash flow rising by 7%. Although the dividend raise slightly outpaces that figure, the company has more than enough of the green stuff to cover the added pennies. This dividend feels quite safe to me. Hormel's enhanced distribution will be paid next Feb. 18 to investors of record as of Jan. 16. Its payout ratio is 45%, while it would yield 2.2% on the most recent closing stock price. The latter is slightly higher than the 1.9% average of dividend-paying stocks on the S&P 500. Our second Dividend Aristocrat for this installment, medical and life sciences conglomerate Becton Dickinson, is bumping its quarterly dividend almost 3% higher to $0.75 per share. Like Hormel, Becton Dickinson's most recently reported revenue figure sagged (by 2% in Q4) largely because of an asset divestment, in this case, a bare majority in its respiratory solutions business. Meanwhile, the life sciences segment grew its take by nearly 6%; overall, the company booked almost $3.2 billion in revenue. On the back of cost savings, adjusted EPS rose by 13% to hit $2.40, slightly topping analyst estimates. Without providing much rationale, the company proffered guidance for 2018 that anticipates 5% to 6% year-over-year growth on the top line and a stronger improvement of roughly 12% for EPS. 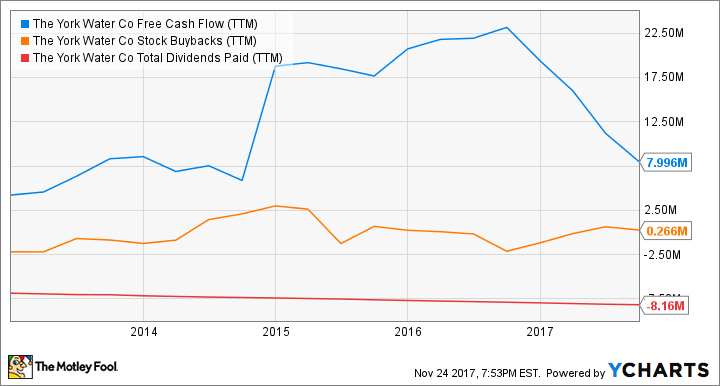 Meanwhile, although the company's $2.55 billion in operating cash flow was essentially stagnant in 2017 compared to the previous year, it was sufficient to pay for both the dividend and a set of share buybacks. Given that, I see little reason why Becton Dickinson won't be able to remain Aristocratic, at least into the immediate future. 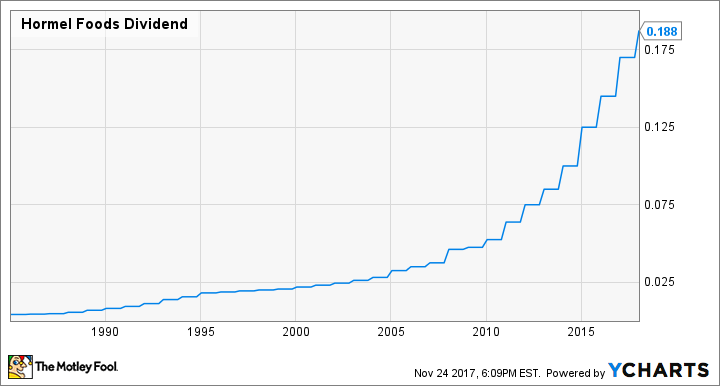 The upcoming dividend from Becton Dickinson is to be handed out on Dec. 29 to stockholders of record as of Dec. 8, and its payout ratio amounts to 31%. It yields a theoretical 1.3%. Although not a Dividend Aristocrat, habitual dispenser Pennsylvania-based utility York Water is keeping up the flow with its 588th consecutive shareholder distribution. The company is raising its quarterly dividend by 4%, putting it just under $0.17 per share. Given the nature of their business, most utilities are strongly regulated by their municipalities, and thus their financials are usually quite steady. That's a big reason York Water's revenue inched up by less than 1% on a year-over-year basis in its Q3, to just under $12.7 million. But because of factors such as cost savings and lower taxes, net income saw a relatively chunky 10% rise to $3.9 million. Thanks largely to the boost in net profit, operating cash flow saw a 5% improvement to just over $6 million. Yet the utility's recent investments in maintenance and new infrastructure -- such as a new raw water pumping station -- have resulted in a dip in FCF, to the point where it doesn't quite cover the dividend payout and recent share buybacks. I wouldn't worry about the viability of York Water's dividend, however. 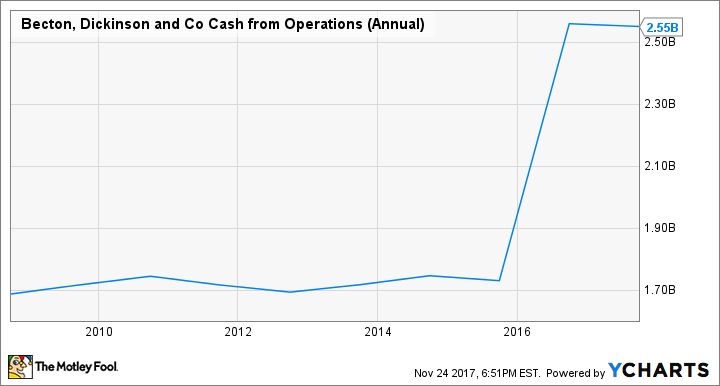 In recent years the company has taken care to have enough FCF to cover dividends and stock buybacks. Therefore, I believe it'll revert to habit and at least be able to maintain the new distribution. York Water's next dividend will emerge from the pipe next Jan. 16 to shareholders of record as of Dec. 29. Its payout ratio is 54%, and its yield on the latest closing share price is 1.9%.